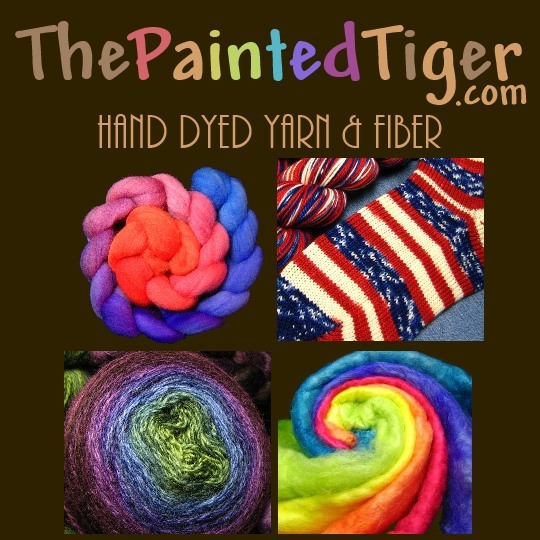 Welcome to ThePaintedTiger! I'm Brooke, your dyer, knitter, and shipper all in one. From a very young age, I've been fascinated with making beautiful things. Throw in the sheep we had on the farm, and a love of yarn and fiber was born. Fast-forward, and here I am with a degree in Biology and Chemistry Education, a husband, and two children. Music is another great love of mine, and a new choir starting in town, RiverChor, needed a 'costume'. Not finding what we wanted in flowing blue, I learned how to dye the silk scarves and ties we would need. Suddenly, I put two and two together, and have been dyeing yarn and fiber ever since. Inspiration comes from our Mid-Western surroundings. Our home is in the woods, and we can catch glimpses of the Mississippi River from here. Sunday drives take us through bluffs, apple orchards, and cornfields. Everyone is friendly here in Iowa, and that spills over into my customer service.....so drop me a line! I take conservation seriously. I've sourced my materials as close to me as I can, preferring domestic wools and suppliers. I'm excited to say that this is becoming more and more viable as people are discovering the benefits of buying locally and supporting family owned businesses. Water is reused throughout the dyeing process, and every last drop of dye is slurped...none to go down the drain. I batch up the day's dyeing and heat them all at once to conserve energy. Packing and shipping materials are either reused, or recyclable. I have children of my own, and it strengthens my commitment to lessen our impact today for a cleaner, greener tomorrow.